Election 2016 Primary. These are stories concerning the 2016 Primary Election cycle, mostly involving Pennsylvania. Will he be the D nominee? Joe Biden Lurks — We are going to make a prediction that Hillary Clinton will not be the Democrat candidate on the presidential ballot this November. This is not one of those prognostications that one should bet the farm on and take to the bank. In fact, we figure there is a 49 percent shot that the Bwicked Bwitch will be the donkey nominee. But that still means we think the odds are that she won’t so we have crawled out on our limb. So will it be Bernie Sanders? The corporate cronyists that control the Democrat machine want a sincere socialist even less then does the American people. We think they will succeed in torpedoing him, unlike the cronyists in the RNC did with the USS Trump. So who will it be? 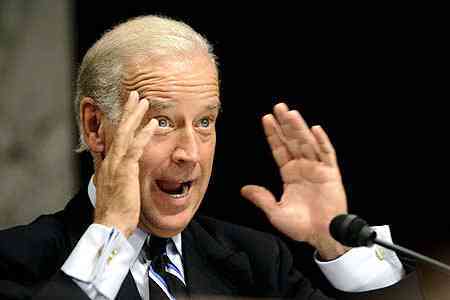 Well, Joe Biden lurks and he is a tame sock puppet. Now, Cousin Joe is not very bright and he has serious family issues but he’s likeable and popular with Middle America. Hopefully, The Donald has a contingency for dealing with him. By the way, did you see where Trump has now taken on Jeff Bezos of Amazon and vice versa? Bezos who keeps the Washington Post alive as a useful tool has sicced 20 of the paper’s operatives on Trump. Trump notes that Amazon benefits from tax policies that are unfair to other retailers and has been escaping anti-trust enforcement. He notes that his election would change that status. Tornado Tom Trump Report — Tornado Tom Padula of Unionville High School, unlike us, actually made it into Donald Trump’s rally in West Chester, April 25, and has a great report. Post Primary 2016 Thoughts — Congratulations Mike Puppio and Pat Meehan, and kudos to Stan Casacio for getting into the arena. Except for the top of the ticket, our choices did not do so well. Truthfully, the only one we are really upset about is Joe Peters loss to State Sen. John Rafferty (R-44) in the Pennsylvania Attorney General Republican Primary. A win by Peters would have been a big win for the forces of truth, justice and light, and a big blow to the special interests and those who feel no qualm about looting the public treasury. And even if Trump lost big, the results of a small committeewoman race in Chester County would still make today a good day. Congratulations Donna Ellingsen for sticking it to the bullies. And if one should be wondering we are 100-percent behind Pat Meehan for re-election this November. BillLawrenceOnline Voting Choices — Today is Primary Day in Pennsylvania and while endorsements are usually counter-productive exercises in arrogance and pomposity, there are still some who follow this site who are curious as to how we (I) will vote. 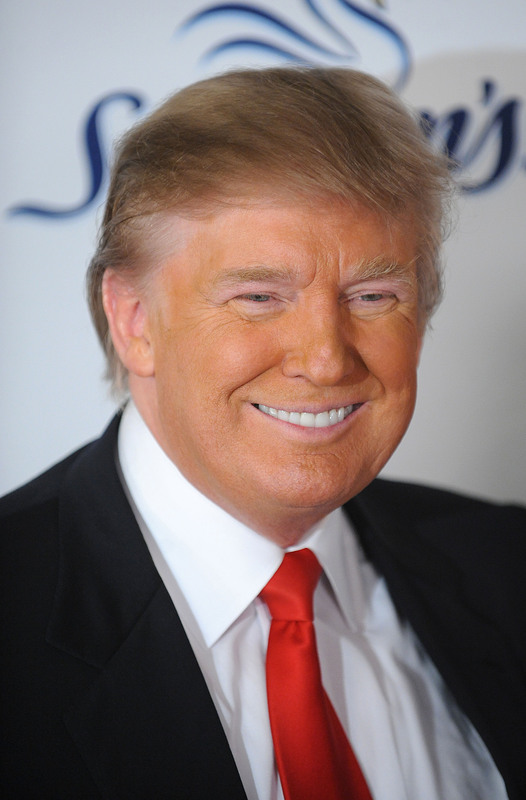 Donald J. Trump for President. The Donald has boldly said things that needed saying and didn’t back down when confronted by the usual self-appointed arbiters of propriety as political candidates have invariably done in the past. In fact, rather than changing positions on “controversial” matters we have seen other candidates come to his way of thinking. The issues on which Trump did appear to flip, the flip came quickly and decisively and was not so much a change in substance but nuance. Trump has run his campaign with brilliance bordering on genius. He has achieved a commanding lead in the face of opposition by the media and the political establishments of both parties. And without funding from special interests. Six months ago, few pundits expected him to be even in the race. Obviously, he has the skills to be president. Ralph Wike, Jan Ting and Mike Puppio for 7th Congressional presidential delegates. Wike of Springfield and Ting of Haverford Township are declared Trump supporters. Puppio, who chairs the Springfield Republican Party, has pledged to vote for the district’s winner on the first ballot. We know and like Mike, and respect his integrity and political instincts. If the 7th District (or Springfield) go strongly for Trump we suspect he will stick by The Donald. If not, who is to blame him if he does otherwise. Stan Casacio for Congress. 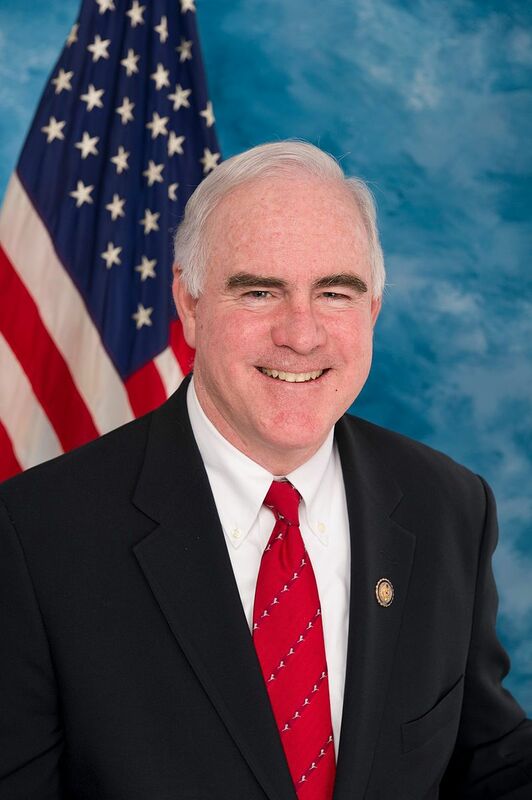 We fully expect his opponent in the 7th District, incumbent Pat Meehan, to win in a landslide. Still every vote for Casacio sends a message to Meehan that there others besides unions and the abortion lobby that he’d better listen to occasionally. Joe Peters for Attorney General. Peters has a long, highly regarded, non-partisan, boots-on-the-ground career in law enforcement. His opponent, State Sen. John Rafferty (R-44), is a hack. Rafferty takes money from the same crowd that contributed to our present disgraced Democrat Attorney General Kathleen Kane. We fully understand that there are intelligent and decent people who will choose differently. Excepting the attorney general race. There, an informed intelligent and decent person could only vote for Peters. Trump fans remained in good humor despite not being able to see their guy in West Chester. Trump West Chester Excitement — Donald Trump’s rally today, April 25, in West Chester, Pa. was way overbooked and while 3,500 filled the venue at the eponymous university’s Hollinger Field House thousands more mingled outside unable to get in. They still made themselves useful, however, facing off against a contingent of protestors — many of whom were bused in — on opposite sides of South Church Street. Anti-trump protestors. Some held signs preaching love. 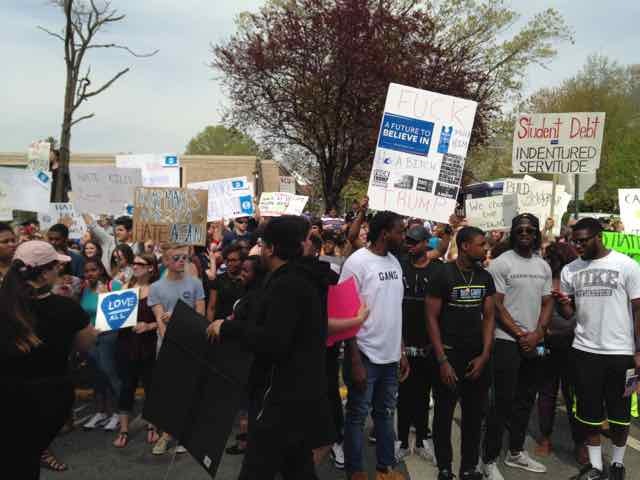 Others held signs filled with insulting obscenities. An anti-Trumper tries to be edgy by pretending to hit golf balls off this bus which brought many of the protestors to the site. 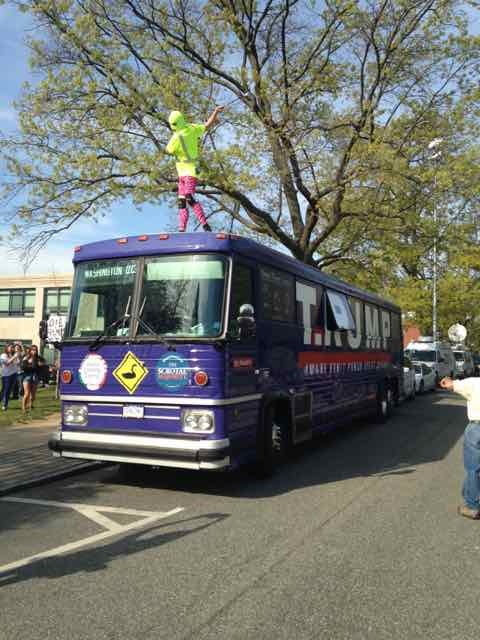 The bus carried the Trump logo along with middle-schoolish sexual innuendos. A line of police from several departments including Pennsylvania State Police, Montgomery County and Phoenixville kept the sides apart. Except for some chanting, which was more often good-natured than not, nothing untoward was seen happen by this reporter. Say what you want even missing it was more interesting than a Kasich rally. A video of Trump’s talk can be found here. April 26 Ballot Question — There will be one question on the ballot in Pennsylvania spring election, tomorrow, April 26. While only registered Republicans and Democrats can vote in their parties’ respective primaries, all registered voters are eligible to weigh in on whether the Pennsylvania Constitution should be amended to abolish Philadelphia Traffic Court. We think we are going to vote yes. A question regarding raising the mandatory retirement ages for Pennsylvania judges has been moved to Nov. 8, according to Ballotpedia. 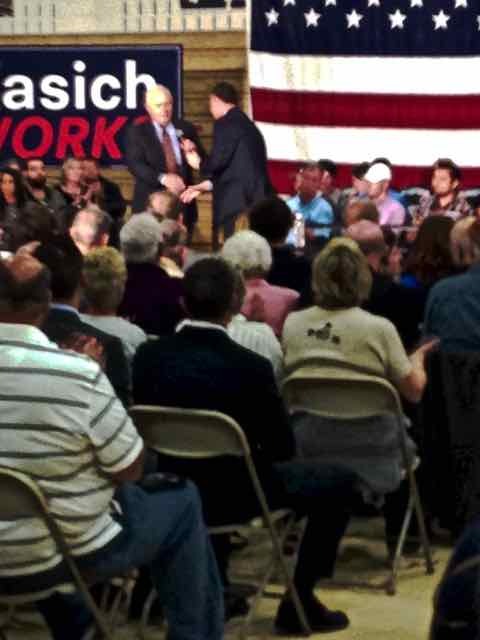 Cruz Kasich Play Survivor — Texas Sen. Ted Cruz and Ohio Gov. John Kasich announced an alliance, yesterday, April 24, to keep Donald Trump from getting enough delegates to win the Republican presidential nomination in July. They are missing that the American public is not watching “Survivor” but “The Apprentice” concerning this process, and not with The Donald playing The Donald but they. They will stay home and not vote for the congressional candidates, the senate candidates and the state legislative candidates. It could very well mean the end of the GOP. People are sick of the political class. They are sick of how they use the spending that has gained us a $19.25 trillion debt to create filthy rich lifestyles for themselves. They are sick of their demand for approval of strange and intolerant sexual lifestyles. They are sick of their unwillingness to confront an aggressive and violent political philosophy that stands against everything upon which this country was founded. John Kasich has no chance at a popular nomination and should drop out. If Ted Cruz should shine tomorrow in Pennsylvania and the other primary states, win California and become the nominee at a contested convention, most will find that to be fair. But if he gets it by playing kindergarten games it is over, and this alliance with Kasich is an indication that that is what he plans to do. Regarding tomorrow’s Pennsylvania primary, the delegates pledging themselves to Trump in the 7th Congressional District are Ralph Wike of Springfield and Jan Ting of Haverford Township. A list of delegates statewide is here. Here is Trump’s statement on the Cruz Kasich Survivor Alliance. It is sad that two grown politicians have to collude against one person who has only been a politician for ten months in order to try and stop that person from getting the Republican nomination. Senator Cruz has done very poorly and after his New York performance, which was a total disaster, he is in free fall and as everyone has seen, he does not react well under pressure. Also, approximately 80 percent of the Republican Party is against him. Governor Kasich, who has only won 1 state out of 41, in other words, he is 1 for 41 and he is not even doing as well as other candidates who could have stubbornly stayed in the race like him but chose not to do so. Marco Rubio, as an example, has more delegates than Kasich and yet suspended his campaign one month ago. Others, likewise, have done much better than Kasich, who would get slaughtered by Hillary Clinton once the negative ads against him begin. 85 percent of Republican voters are against Kasich. Collusion is often illegal in many other industries and yet these two Washington insiders have had to revert to collusion in order to stay alive. They are mathematically dead and this act only shows, as puppets of donors and special interests, how truly weak they and their campaigns are. I have brought millions of voters into the Republican primary system and have received many millions of votes more than Cruz or Kasich. Additionally, I am far ahead of both candidates with delegates and would be receiving in excess of 60 percent of the vote except for the fact that there were so many candidates running against me. Moderator Jocolyn Bowser-Bostick presents Darryl Cherney to the audience at the Green Party Caucus. 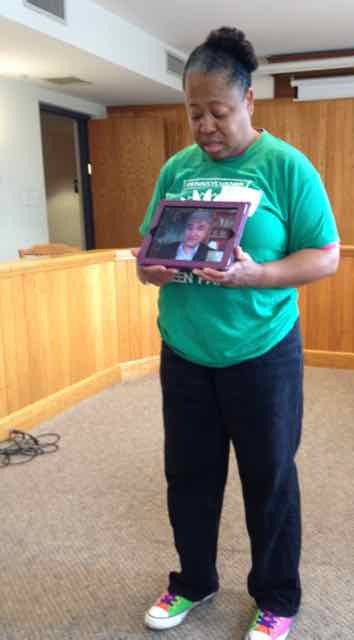 Green Party Caucus In Delaware County — The Delaware County Green Party held its caucus, today, April 23, at Swarthmore Borough Hall. Seven persons attended and four voted. Spokesman Bob Small said turnout was way down from recent years as the major parties are still having hotly contested primaries. There are 13 candidates on the ballot five of whom are endorsed. They are Darryl Cherney of Northern California, Sedinam Kinamo Christin Moyowasifza-Curry of Southern California, William Kreml of South Carolina, Kent Philip Mesplay of Texas and Jill Stein of Massachusetts. Cherney talked to the audience via Skype. He said that among his achievements were founding the Headwater Redwood Reserve and winning a $4.4 million lawsuit against the federal government after the FBI alleged he and Judi Bari had blown themselves up in a pipe-bomb incident in 1990. He said that among the first things he would do if elected president would be to pardon several people including Chelsea Manning and Leonard Peltier, and cover the White House in solar panels. He also said he would ban fracking and create a new commission to re-investigate the 9/11 terror attacks. He said the first investigation was a cover-up and cited as evidence the current attempt to declassify of 28 of its pages allegedly implicating Saudi Arabia. Ms. Curry talked to the audience by phone. She said the Green Party is run by white males over 50 and it is her goal to get more woman of color in power in the party and, presumably, the country. Statements were read from Kreml and Mesplay by moderator Jocolyn Bowser-Bostick. Ms. Stein, who was the party’s candidate in 2012, is expected to win the nomination again this year. There are about 600 Green Party members in Delaware County. Small noted before the caucus, that while only registered Republicans or Democrats may vote in their respective party primaries on Tuesday, there is referendum question regarding amendments to the state Constitution available to all registered voters. Shall the Pennsylvania Constitution be amended to abolish the Philadelphia Traffic Court? A question regarding raising the retirement age for judges to 75 has been rescheduled until November. 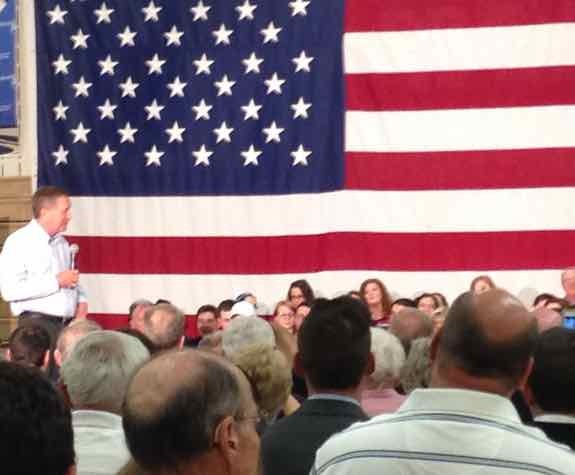 Kasich Bores Delco — Ohio Governor and puzzling presidential candidate John Kasich bored a crowd of 300-plus at a campaign town hall this afternoon, April 21, in Delaware County, Pa. The event was held at the Penn State Brandywine Campus Commons Building in Middletown Township. Among those in attendance were curious students who had no plans on voting for the GOP candidate whoever it would be. Bob Asher being introduced before he introduces Gov. Kasich. It is impossible for Kasich to get the required number of delegates via the primary process to secure the nomination. So why is he running? Well, he was introduced by establishment epitomes Bob Asher and Andy Reilly, who chairs the Delaware County Republican Party. Maybe he figures there is way to get the prize outside the primary process. Anyway, Kasich’s performance was boring. Mind-numbingly, painfully, excruciatingly boring. He even sadistically alluded that he was being boring on purpose. He gave long, rambling answers to audience questions. He said strange things that made no sense such as his claim that drug problems would go away if schools and churches taught that doing drugs was bad. Okay. Guess that’s never been done. He blamed the rage in the country on talk radio and (cough, cough) talk TV. He said things of substance as well, though. His hallmark was the danger caused by our $19.251 trillion debt and even included as part of his visuals a running debt counter, so kudos there. He advocated war against ISIS and an expansion of global intelligence capabilities. He endorsed devolving government services to states and said — unfortunately quite boringly — that problems were best solved locally and even individually. He boldly said that the 11 million illegal aliens — his estimate — now in this country should be given a path to legal residency if they have not been involved in crime. “But never citizenship,” he emphasized. And there were times he sounded almost Trumpian. If elected, he said that in his first hundred days he would stop all federal regulation excepting those involving health and safety, and require all regulation be made by legislative votes rather than administrative fiat. He said he would cut the corporate tax and the personal tax rate. We are probably missing some things but we are only human and he was Boring. Note the capital B.